CEO x 1 Day (CEO for 1 Day) is a highly competitive and prestigious program that enables Canada’s most promising future leaders to spend a day in February or March learning from the CEOs of top-notch Canadian organizations. 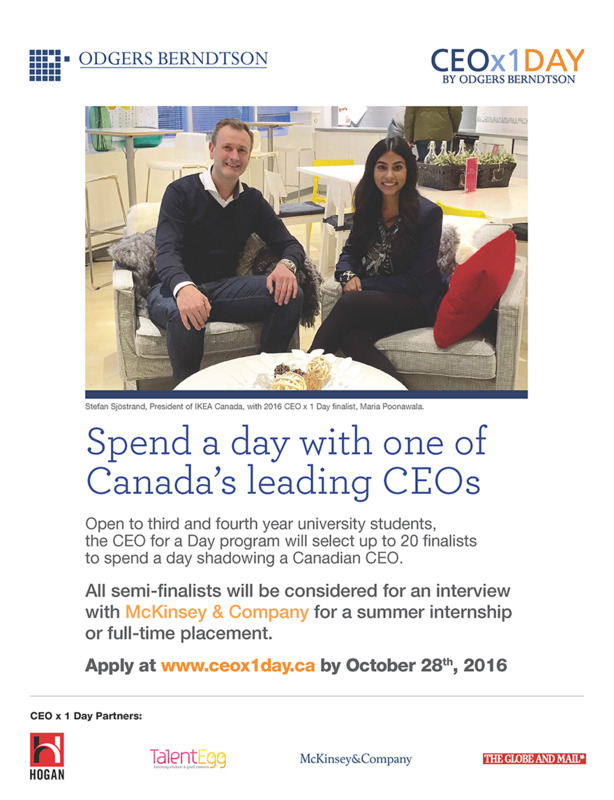 Since its launch in 2013, CEO x 1 Day has been providing post-secondary students the opportunity to spend a full day shadowing CEOs from leading Canadian companies. Finalists will be given the opportunity to apply in-class learning to real world situations, gain outside-the-classroom experience, and develop the interviewing, leadership, and networking skills needed to start building their careers - today. In 2017, CEOs from Siemens Canada, Linamar, and CBC among others will be participating in the event. Finalists have said that the impact of CEO x 1 Day extends beyond the final event - throughout the selection process they got meaningful feedback on their leadership style, practical career advice, opportunities to hone their interviewing skills, and hands-on knowledge of what it takes to be a successful leader. In addition to networking with Canada’s most influential business leaders, semi-finalists are automatically considered for an interview with McKinsey & Company for a summer internship or full-time placement. All 3rd and 4th year undergraduate students enrolled full-time in any faculty/program are encouraged to submit an online application.